Roadside restaurant chain Little Chef, home of the 'Olympic' breakfast, is being put up for sale by owner R Capital. Little Chef, the half-a-century-old roadside staple for tired, hungry motorists, is being sold by R Capital after nearly six years on its portfolio. The turnaround specialist plucked the struggling chain out of administration back in 2007, paying less than £10m. Since then, the chain has undergone a series of renovations. 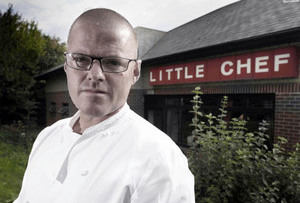 Most memorably in 2009, Heston Blumenthal was brought in to soup up the menu and put Little Chef back on the (road) map. The celebrity chef’s dabbling – and Channel 4 series – brought about a spike in customer numbers and his refitted concept restaurant in Popham has become the template across the chain’s 78 outlets (down from 230 in its heyday). Blumenthal’s magic touch brought about a 47% uplift in food sales in 2011, but just a year later, the chain was in dire straits once again and was forced to close 67 restaurants with the loss of nearly 600 jobs. Little Chef’s market share has been steadily eroded by rival fast food restaurants like Burger King and McDonalds. Nonetheless, R Capital stands to make a decent profit from Little Chef. Analysts are predicting that the buyer (Starbucks and Costa Coffee as well as rivals Welcome Break and Moto are rumoured to be interested in the sites) will have to pay ‘tens of millions’ for the chain. It is not clear at this stage whether the new owner will keep the Little Chef brand alive but it seems unlikely. Is this the end of the road for Fat Charlie?